Dan Pusch joined PJ Morgan Real Estate in 2015 as a Realtor, and we’re lucky to have him! He brings extensive sales experience to the role, and, as an Omaha native and lifelong resident, he’s well-acquainted with the city’s intricacies. Combining his skills and knowledge with his passion for providing top-notch customer service gives his clients an advantage above the rest. Dan’s real estate experience also extends to residential construction, with a background in HVAC installation, tiling, wood flooring, landscaping and much more. Being a jack-of-all-trades, Dan is able to lend expert insight to buyers and sellers, as he knows homes inside and out. 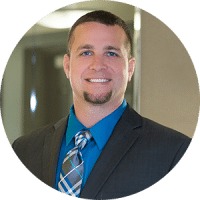 Dan attended Northwest High School and holds a Bachelor of Science in Business Administration from the University of Nebraska – Omaha. He and his wife have two children, and he enjoys fishing, bicycling and working on projects around the house in his free time. Would you like to buy or lease?